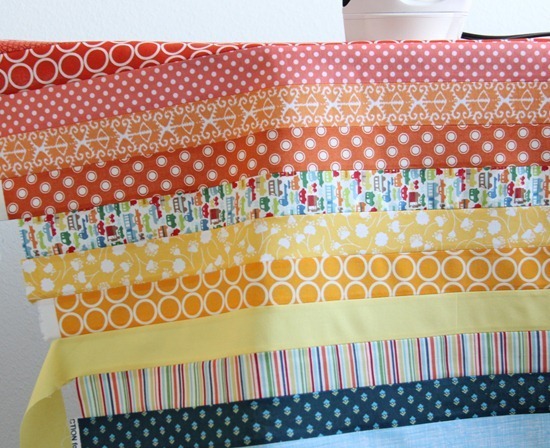 This fun scrappy quilt is quick to put together and great for beginners. Use lots of different colors to keep it bright and fun…or just a few colors to keep it calm and simple. 2 white strips 1 1/2″ x width of the fabric (at least 42″). 2. Lay the color strips out in the order you want them. 3. 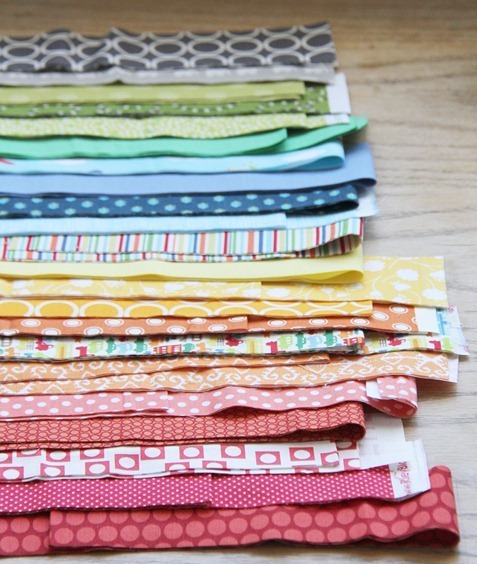 Using a 1/4″ seam allowance, sew the strips into pairs first…then sew the pairs all together. Alternate the sewing direction when sewing the strips/pairs together, and don’t pull the strips…this will help prevent stretching and keep the strips straight. 4. Press the seams open. This takes a bit more time but the nice straight seams are worth it! 5. Fold the length of the quilt top in half and align it carefully on the cutting mat. Trim the edges straight until the quilt top is 35″ wide. 6. 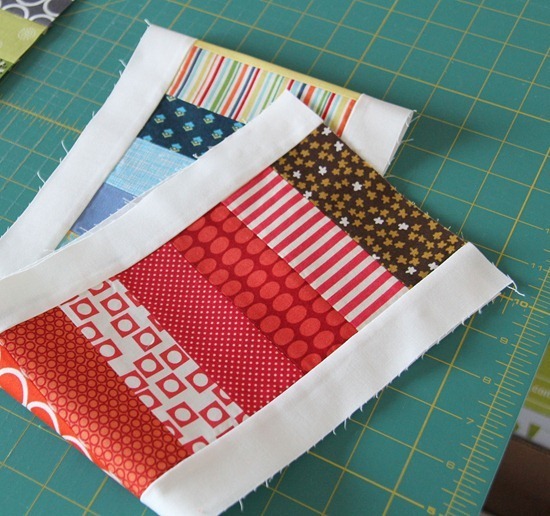 With the quilt still on the cutting table, make a cut 8″ in from the right side. Make another cut 5″ in from the last cut. 7. 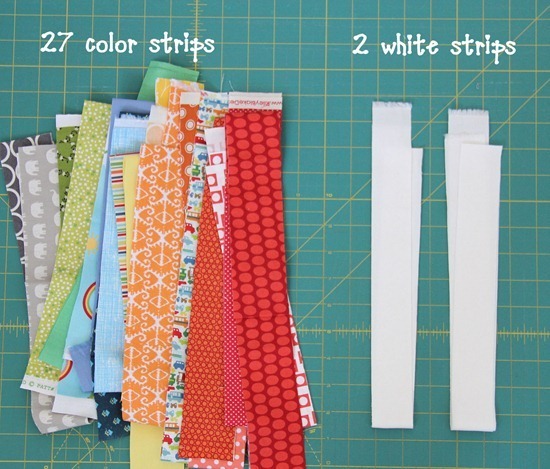 Sew a white strip onto each side of the 5″ strip. Press towards the white strips and trim the ends. 8. Rotate the strip 180 degrees, and sew the strip back in between the larger pieces to make the quilt top. Press towards the white strips. To see how I finished this quilt see the post here. This is adorable, and looks like you can whip it up in an afternoon! Love the quilt ! Your directions are very thorough and easy to understand. Am going to make this. Thank you, will be following your blog. Have a blessed day! 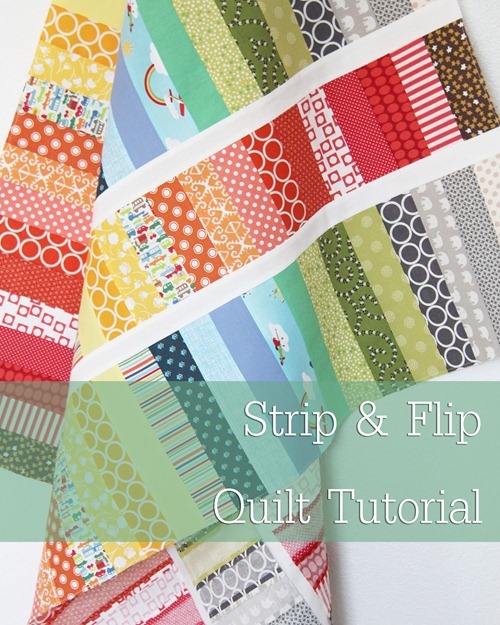 Love the quilt but did you use any batting between your quilt and the backing fabric? Love the variety of designs and colours!! Thanks for sharing this tutorial and the tips!!! This is so simple but awesome!!! I love all of the colors! Wonder how it would look from a jelly roll…maybe with a Robert Kaufman Kona Cotton Roll Up!!! 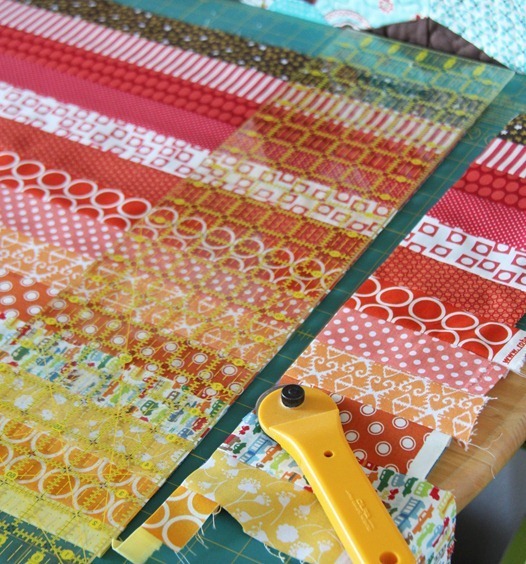 Wondering, did you ever try this using the jelly roll? If do, what changes did you you make! Thanks…… just a beginner but trying to learn ! 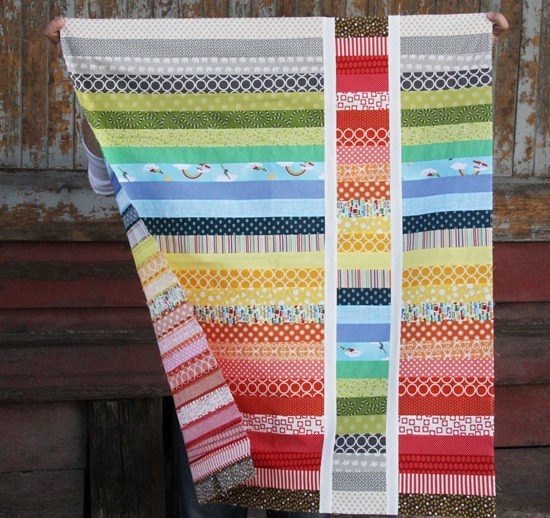 I haven’t used a jelly roll but I’ve seen it done…I would just make it a tad wider! I made it with a jelly roll yesterday….calling it my Mother’s Day Quilt…I saw that the strips were 2″ instead of 2.5″ and said “no way am I doing all that trimming” so I used 21 strips total instead of 27 which is almost the same finished dimensions, and now I have 20 strips left that I can make another quilt! I used the Confetti jelly roll. Love it! Wish I could post a picture of it. I would use various strip widths to make it even more interesting & of course, use more of ones left overs then when you flip the smaller section you won’t have to worry about matching seams. Fast and easy ~ my kind of sewing! Thanks so much for the tutorial ~ such a bright and cheery quilt. Thanks Allison! I always love your work! I love this! It's super clever. It might become my go-to baby quilt pattern! Very nice. Wish I had a lot of those colors in my stash, but a perfect inspiration to keep adding…Thanks! Absolutely gorgeous but oh so fun!!! Thank you for a great tutorial for a wonderful little quilt. What a great way to use up some of the bits of fabric I have laying around!! I just love this, and especially the way you flip that one piece and put it back in. Love that! 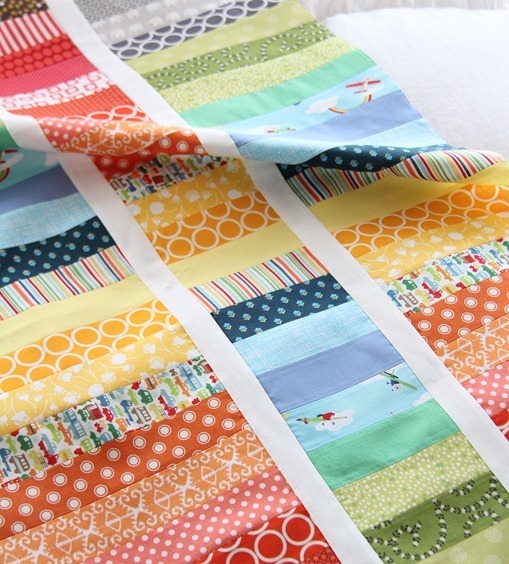 And if you go with 2.5" strips, it's jelly roll friendly! Yay! this makes me want to quilt. well, i do want to already…this makes it look do-able for me! I love this quilt so much! thank you for the tutorial! Super cute, fun, and fresh. Love it!!! I love this! I am rather new to the sewing world and was wanting to find a simple to understand pattern for a quilt. I am getting a cutting mat and new rottary cutter for my birthday, so I will have to try this out! Thanks so much for these awesome quick tutorials. They are so good! Your ideas and tutorials are awesome and achievable. Thanks so much for sharing!! Too cute! Great way to use up scraps too! this is sooo cute! thank you for sharing! thanks for sharing this, my best friend is having a baby and now i know what I can 'attempt' to make her. Beautiful quilt and your tutorial makes it look achievable. Thank you. Hope you have a lovely weekend. When I saw this the other day I secretly hoped you would put up a tutorial! Love it!! Thanks for this great easy, but effective quilt. I love it! Great quilt. Love the colors. 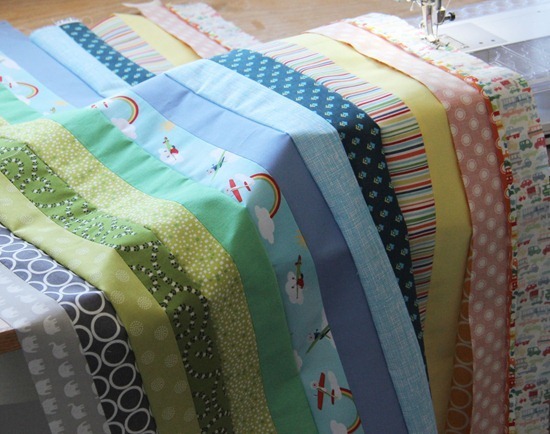 The strips would be super fast to cut with the AccuQuilt cutter, or the Go Baby cutter. Thanks for sharing! What a cute and quick and simple baby quilt! I'm thinking that cutting out the piece and putting on sashing would make one of those 2 1/2 strip "race" quilts more interesting!? ding, ding, ding!! love this idea, it's so effective but super fast and easy!! Am going to 'pin' it now so I don't lose it. thanks so much for taking the time to blog it. Cat. Fast, fun, and cute is such a satisfying way to sew! Nice work, as usual! This is great work! Thanks for sharing! Thanks for the tutorial. You make it look so simple– would love to give it a try. Really pretty and super fun! 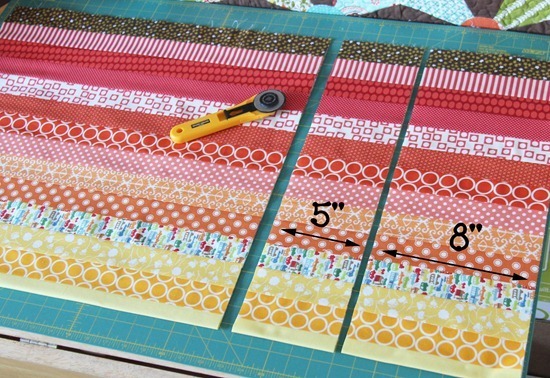 I think this would be a great project to do with a jelly roll (just so I don't have to cut the strips). i just found your blog… where has it been all my life! haha…ive spent the past 2 hours exploring and im so excited about what iv'e found! this quilt in particular. i will be whipping it up soon! thanks for sharing!!! Love your tutorial and the quilt is just beautiful. Love the fun colors. May even give it a go this weekend. What a great quilt! Another winner from Cluck Cluck Sew! 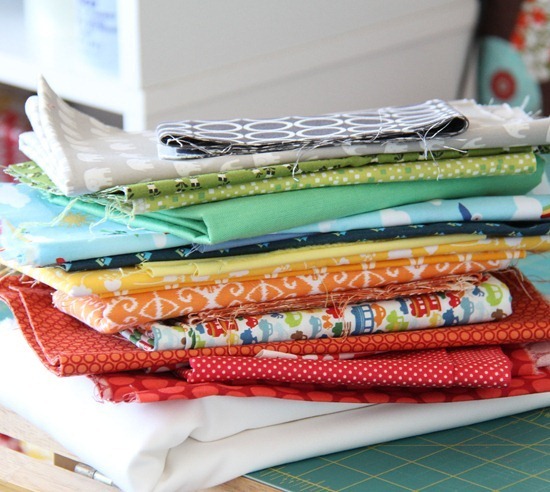 Lov'n your blog and you are making me want to sew again! Beautiful work! this is BRILLIANT! thank you so much for the tutorial! love your fabric choices, too! I just want you to know, I found your site through Pinterest, a post of this adorable quilt ! I am primarily a food blogger, but sometimes sewing, quilting and crocheting are what relaxes me more ! You have an absolutely beautiful site, and just browsing through has relaxed me for my day ! Thank you ! simply wonderful and creative. I love that it flips the pattern and that it uses so many different patterns, and colors. How fantastic would this be with a jelly roll from V & Co's new Simply Color line? So easy and pretty! My first attempt at making this quilt is at the link below. I found the idea here on your blog so I thought I would share. Thanks so much for the great idea! This. Is. Awesome. Just saw the link at "The Name Game" at "Live a Colorful Life". Now you've got me inspired. Beautiful simplicity. Thanks for sharing! This quilt is just perfect. I have just discovered this site and I think it's fantastic. Thank you. No. 1 fan. Hi Allison! I love this and it's in my "quilting queue" that's for sure. I just heard that someone placed the child's name on the strip…wouldn't that also be awesome? So many options on placement on that one, huh? Blessings on your New Year! Cute, cute quilt! Thanks for the tutorial!! Made one this weekend for my daughter. I love it – it was so simple – yet stunning results. Thanks for the tut!! <3 <3 <3 THANK YOU! I needed a quick finish and a new blankey for my foster baby. With one modification, this was done in a couple hours. (I did 4" strips instead of 2") Came out SUPER cute!!!! I love your designs. But I have one question for this lovely quilt. How did you cut the long strip straight? Did you fold the fabric half the WOF? I had a difficult time doing a straight cut when I folded the fabric before. Thank you. I'm fairly new to quilting but I just had to try making this one. The excuse I used was some friends of ours were expecting their 2nd child. The color scheme was grey, purple & lime green (in the new nursery.) I used purple minky for the back & purchased lime green satin blanket binding to finish the edges. I couldn't believe it turned out as neat as it did! Keeping all those strips straight was a bit tough but I managed some how. I came across your blog when I saw a pin on Pinterest. This is amazing. I really want to start quilting, but all of it seems so difficult and confusing. This seems like something even I can do! wow, I really like this quilt pattern. I am going to make it for sure. they would make great gifts. It looks very fun and easy to make. Wow!!! Love love love :). Thanks for sharing the tutorial. It's now on my do make list :). I used this tutorial to make an ombre quilt! Thanks so much for sharing! I just found your tutorial post through Southern Fabric. I like the simplicity but being somewhat new, I have a question: How do you keep track of alternating sewing direction for the strip pairs? Thank you! I love this idea, but the pictures don't show up in the tutorial. I would love to see them. Thanks for sharing the quilt and directions! I was wondering how you'd quilt this? Try to follow the stripe pattern or do something more flowy? I would recommend pressing the seams AWAY from the white strip (… press to the dark side). I love the way the white helps contain the strips. I love scrappy, but it can be a bit much. This is a great balance of crazy and calm. I bet this would work fabulously with strings (strips of varying widths), too. I LOVE THIS QUILT …. LOVE, LOVE, LOVE …. every time i see it, it makes my heart smile and my eyes happy …. i need one just like it …. I love your quilt. I'm going to use a smaller variation of your technique to create a tote bag or perhaps a journal cover. I love it so much I want to be able to look at it all the time!! How did you quilt this? Machine or free-motion! And what pattern did you use? I’ll also stick the link at the bottom of the post in case the link in the comments doesn’t work. Thanks! The perfect quilt for a beginner. My granddaughter made her first quilt just before her 6th birthday. It was simply sewing twenty 8 inch blocks together, enveloping and tying it. she is now 7 and this one is perfect for her next pattern. It looks easy to do from a quilter’s standpoint but non quilters with think it was hard to do. Thank you for giving us such a cute pattern. Her cousin’s baby is due in September, so we better get started. P.S. Grandma still does the cutting. Made this as a baby quilt for a little boy. Used batiks and blue fabric for the plain strips. I embroiders the name and birthdate of the baby in the blue strips. Fast and easy and a great gift. Thanks for the tutorial! Love the pattern. I’m headed to my stash right now! Thanks! Your quilts are gorgeous and the colors also. All your quilts are so fresh looking. I never bought material in just a plain color. Thank you for sharing your tips from now on I will try it also. Thanks for the tutorials and the beautiful pictures. Guess not understanding how this is a quilt as you go….no backing, no batting. This is not a Quilt as you go quilt Karen…you are right! I made this out of Christmas fabric to donate to charity, super cute and easy to follow!!!!! I plan to make this with 1 change. I will substitute a piece of plain fabric for the 5″ flipped section and use the cut out one in another quilt. That will be really cute! Very nice! I really like this! But how do I get it as a pdf?